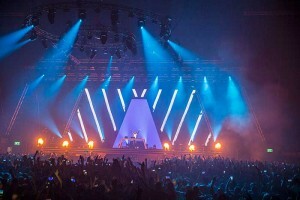 Israel – Three-hundred Robe moving lights helped the one, the only, and the totally awesome Armin van Buuren rock Jerusalem with his amazing "Armin Only Embrace" show, a four-hour trance extravaganza that delighted 10,000 fans packing the Pais Arena to catch the banging vibes and spectacular visuals. 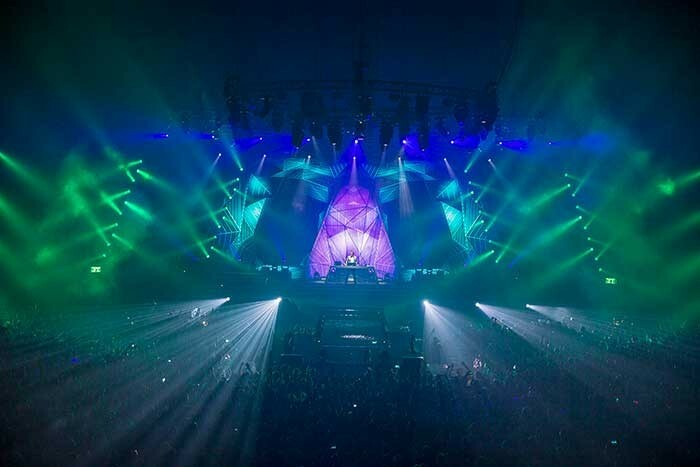 The lighting for the world tour was created by LD Marc Heinz and Andre Beekmans from design practice The Art of Light, and is being directed on the road by Michael Seeverens, who just celebrated his fifth year of working with the award-winning Dutch superstar, DJ and music producer. 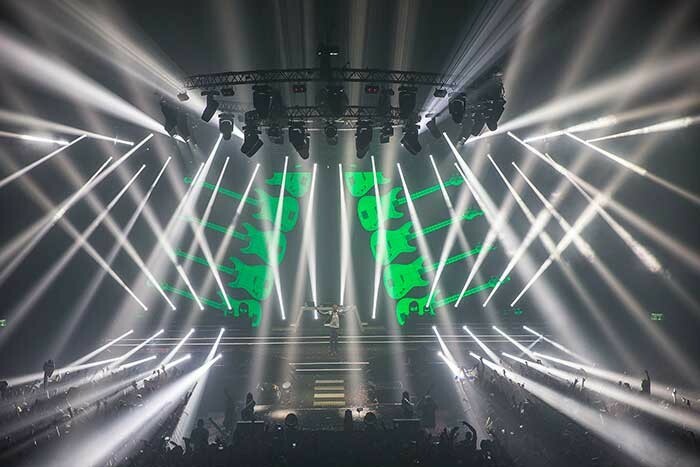 The AO Embrace world tour sources production locally at each location, so the lighting specification is flexible to allow a number of different fixtures to be utilised for the key profile, beam and wash lights. However, Michael is always happy when he sees Robe's BMFLs and Pointes on the kit list. He’s used the brand for some time in his work and thinks both of these fixtures are among the best available on the market right now for this style of show. In Jerusalem, his rig comprised all Robe moving lights, supplied by main lighting contractor, Tel Aviv-based Gil Teichman, with the hire division of Robe’s Israeli distributor Danor Theatre & Studio Systems contributing some of the BMFLs and Pointes as this was an incredibly busy time of year for shows and events. Thirty-two BMFL Blades were used as the main general performer key lights, with 28 rigged across the trusses, over stage and above the catwalk and six downstage, in this case rigged on another truss above the FoH risers for front lighting the B-stage and catwalk. The beam lights in Jerusalem were 74 Robe Pointes scattered all over the trusses and on the stage deck, where they added depth and were used for all the big, ballsy effects look perfect for those lightning quick mega-bold accents and stabs. 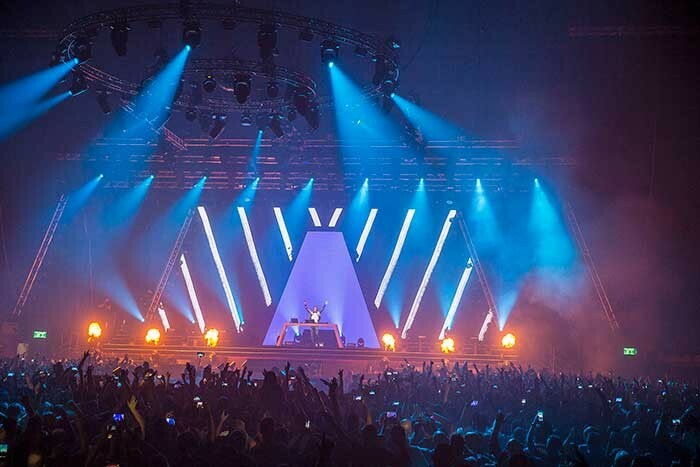 Sixty LEDBeam 100s were positioned ten each on six slanted vertical trusses which extended the width of the stage out into the arena. Other lights on the rig included 32 strobes, 24 LED battens on the slanted side trusses and 22 sets of 2- and 4-lite blinders dotted around. It's the first time they have played with their own production in Israel explained Michael: "It was a great experience working with the Robe kit and the Gil Teichman lighting crew in Jerusalem. They were really efficient, it all ran super-smoothly and I had everything I needed." This was thanks to the fabulous lighting team of 12 from Gil Teichman, crew chiefed by Haim Miakinin. The stage and trusses were pre-rigged the day before Michael arrived, which was a day ahead of the show, and then all the lights were rigged the next day to be ready for an overnight programming season from 11pm to 5am, with the show that evening. 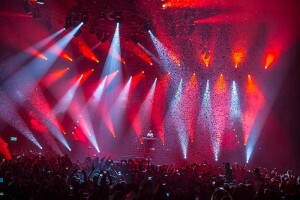 Michael worked closely with video operator Carlo Ruijgers, FoH engineer Wouter Asselman and show director Sander Reneman from the AO Embrace touring crew who also ran music for the warm-up slot, playing some special deep techno remixes by Armin's from a selection of his early hits and favourites.